William T. Hilton, whose work is seen on this tour, was born in 1829 on the western outskirts of Barnesville, and died 80 years later in Barnesville town. He did all his work within a few miles’ radius of his birthplace. No record exists of when or with whom young Hilton undertook his training as a carpenter. Presumable he began early, at 12 or 14, and since he lived at home he must have learned his trade from one of the builders then living in the Barnesville area. “Builder’s book,” with plans and details of currently fashionable architectural designs, was the country builder’s substitute for advanced training. Hundreds of such books were in use in the mid-19th century. By 1850 young Hilton was 21 and must already have become a journeyman, for late that year he married, and soon after left Barnesville to seek a career as master builder in the “Mouth of Monocacy” area (present-day Dickerson). Big commissions began to come his way in 1861 with the construction of the Sugarloaf Mountain Methodist Chapel, and when the Civil War began he purchased for $150 an exemption from the draft so as to ensure the support of his growing family. 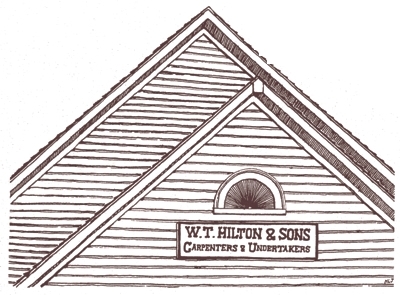 In keeping with a widespread rural practice of that day, Hilton became an undertaker as well as a carpenter. The two occupations were then more closely and naturally allied than is the case today, for coffin-making rather than embalming was the undertaker’s principal function. Toward the end of the century undertaking became an increasingly important part of William Hilton and Sons’ business. The trail begins and ends in Barnesville at the Hilton Shop. You may park at St. Mary's Church while walking around Barnesville. All the houses are privately owned; please respect the owner's privacy. Across Rt. 109 from the current Hilton Funeral Home, this 19th century church building, the starting-point of the tour, has been used since the mid 1940s as a cabinet-maker's workshop and storage shed by the descendants of its builder, William T. Hilton. The building contains some of his account books and many of the woodworking tools he used. A signboard over the entrance reading, "William Hilton and Sons—Carpenters and Undertakers," formerly hung on Hilton's woodworking mill nearby and was placed here when the old mill was demolished. The character of this historic building and its significant records and artifacts strongly support the hope that the building will be preserved for future generations. View from the outside only. The shop is a simple, mid-Victorian structure, devoid of embellishment and characteristic of rural ecclesiastical architecture of this type and period. In 2008, the stained glass altar windows donated by the Belt and Hays families were moved to the Children's Chapel in St. Peter's Episcopal Church, Poolesville. When the first settlers arrived in the Barnesville area about 1750, and for many years thereafter, the nearest Episcopal church was Monocacy Chapel, later called St. Peter's, at what is now Beallsville. During the Civil War, Monocacy Chapel was desecrated and damaged beyond repair. The people of Barnesville therefore petitioned the Bishop for a "chapel of ease," whose cost of maintenance they promised to assume. 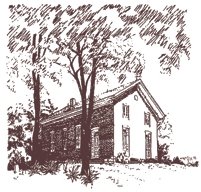 In 1872, Mrs. Eliza Hays and her daughter, Mary, donated land for the Barnesville chapel. This chapel, designated Christ Church, was consecrated December 19, 1878. 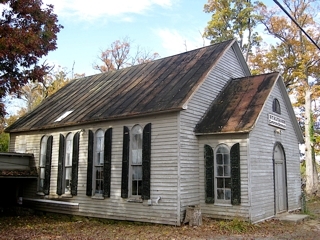 Until World War II the chapel was served by pastors of the parish church, St. Peter's Church of Poolesville. By this time the congregation was much reduced and the building had greatly deteriorated. Accordingly, the wardens and vestry, with the consent of the Bishop of the Washington Diocese, sold the chapel to William B. Hilton, grandson of the William T. Hilton. Three miles north of Barnesville on Route 109, lies the crossroads village of Comus and, on the left, the Comus Inn. The earliest part of the current inn, the central section, was built probably in 1863 for Robert Johnson. Subsequent additions made around 1890 and 1900 are attributed to Hilton. It is possible, although by no means certain, that Hilton was involved in the original construction as well. Born in 1863, he had already made his mark as a local builder. The later additions are harmoniously integrated with the original construction. In 1960 the building was set back from the road and the interior remodeled as an inn. The current owners purchased the inn in 2002. Working closely with the Montgomery County Historic Preservation Commission, they have invested heavily in renovations and an addition that are compatible with the original design. The little chapel and its adjoining graveyard remained in the hands of the “Trustees of the Methodist Episcopal Church of Mountain Chapel in Montgomery County” until 1938 when the voting male membership of the church was reduced to three persons. They voted to sell it to the owner of the lands surrounding it, reserving access rights to the graveyard. In recent years it received a refurbished interior and once again came into use as a church. The adjoining cemetery contains the names of many families with a long history of settlement in the area. This 2-story, L-shaped, simple and utilitarian, brick farmhouse is characteristic of a style widely followed in western Maryland in the 19th century. Built in two stages, the older part (the front of the house) dates from the 1860s and may have been built by Hilton. The rear ell was added about 1900 by a local barn builder. Near the house are several good late-19th century barns and outbuildings. The original section has a wooden porch across the front at ground level, while on the second floor a door opens onto the roof of the porch. The two-story porch along the east front of the rear ell has five bays and a centered entrance with over and side lights beneath a bracketed wood lintel. The windows are "six over six" with bracketed lintels and louvered shutters. Inside the house are a kitchen, pantry, and a large all-purpose room used both as a parlor and for dining. The heavily detailed moldings, doors and a built-in hutch are all made of pine. Mrs. Margaret Davis was a strong supporter of the Montgomery County Farm Women’s Cooperative Market and credited with saving the family farm through the Great Depression. A strong, tireless farm woman, she was known for entertaining an extensive number of relatives each week for Sunday dinner. Until recent times, the road was called Davis Road. This is Mount Ephraim, the name of both the locality (once a community of half a dozen houses) and the fine red-brick mansion on the right side of the road, built by Hilton in 1868 for Ephraim G. Harris. Like the Davis farmhouse, this is a simple L-shaped brick structure characteristic of so much rural building in 19th-century Maryland. At the time it was built it had a bracketed wooden porch across the front; this was removed along with the dormer and other details when the house was remodeled in 1941-1942 by its owners at the time. A pair of glass doors on the second floor façade marks the former entrance from the porch roof. In common with most other country residences built before the coming of the railroad, Mount Ephraim was built of materials obtained close at hand. Clay for the bricks was mined, molded in a hand press and fired on the spot; slate for the roofs was quarried nearby; pine, oak, and chestnut timber was obtained from woodlots on Sugarloaf Mountain. Most hardware was produced by local blacksmiths. Of the major building materials only glass had to be shipped in. Mount Ephraim stands at one corner of extensive land holdings of the Harris family which date back to the 18th century. Until the Civil War Ephraim Harris, like his father and brothers, was a farmer. But with the coming of the war a signal station was established atop Sugarloaf Mountain, the intermediate link in a chain of semaphores connecting Washington with the fort on Maryland Heights overlooking Harper’s Ferry. Ephraim was quick to see his opportunity. He set up a store at the crossroads, thus tapping both the Sugarloaf trade and traffic between Barnesville and Buckeystown over the old route through Parks Mills. His business flourished both in wartime and afterward, and long before the mansion was built his section of “Mountzion,” the family estate, had become known as “Mount Ephraim.” In 1867 his worth was assessed at $5,279. By 1870, Harris was able to employ a cooper full-time in his household, presumable to make whiskey barrels, and also had established a blacksmith shop nearby. The interior of the Ephraim Harris mansion reflects its original owner's affluence. Entered through the long front porch, the center hall contained a staircase with a curving chestnut rail and heavy Victorian brackets on the stair risers. A circular plaster ornament decorated the hall ceiling. The hall led to a parlor on the left and a dining room on the right, while beyond, a door connected to the side porch. A large farm kitchen contained an open hearth for cooking. Behind the house were the well, a washhouse and smokehouse, chicken house and a small barn. The decor throughout was Victorian, exhibited in the design of woodwork, plaster ornament and mantels over fireplaces in the principal rooms both upstairs and down and a design motif reflected in the ornamental lintels of the exterior door and windows. All of these interior design details were removed in the remodeling of the house in 1941. The house has been documented through photography in the Historic American Buildings Survey. The property was divided in 1910 after Ephraim Harris’s death, but remained in the hands of relatives until 1919 when it was sold to Francois F. Darrieulat, President Theodore Roosevelt's fencing master and coach of several U.S. Olympic fencing teams. In 1941 Mount Ephraim was acquired by Frederick and Mary (Polly) Gutheim "Fritz" Gutheim, George Washington University professor, was a major force in the preservation of the rural and historic character of the region and an author of the M-NCPPC Ordinance and Master Plan for Historic Preservation in Montgomery County and The Potomac. Polly Gutheim, born in England, kept a large flock of chickens and was influential in St. Peter's Episcopal Church and the Monocacy Garden Club. The Gutheims remodeled Mount Ephraim, their home for fifty years. The current owners purchased the property in 1991 and have remodeled. Now turn left onto Harris Road (dirt) to look at the houses of Barnesville, where Hilton lived and worked during his most productive years. 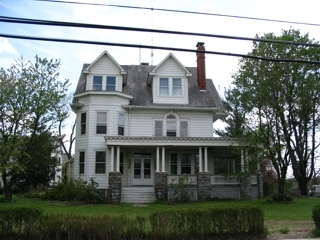 A frame rectory was built in 1867 for Father Spryut, pastor, near the present rectory that replaced it on the same site in 1932 at a cost of $10,000. In 1993, when the present rectory was built behind the pavilion, the brick house for the priests was converted into offices and classes. The pavilion was once half the size it is today, with drop-down wooden shutters that were lowered to admit the e summer breezes for the suppers and dances that followed. Wooden benches adorned the walls for the wallflowers and exhausted dancers. The suppers were prepared in the kitchens of the parishioners for the great annual Barnesville Picnic, now held annually for over a hundred years, with a brief postponement during World War II. Earlier in the day, joustings were held, with knights vying for the affections of their ladies in grand attire. This attraction is still held. Meals are prepared in a Health Department approved kitchen which was added on when the building was expanded and modernized, remodeled and with a fireplace installed. This red-brick Victorian Gothic church at the west end of Barnesville (parking available) was built by Hilton in 1900, replacing a wooden structure that had burned the year before. 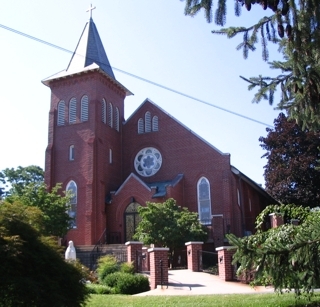 The brick church is the third church built on this site, a parish seat since 1741 when the Carroll family donated land to establish a meeting place for Catholics in the area. Its styling, which includes a leaded-glass rose window above the double entrance door and a Romanesque campanile, was probably based on a then-current architectural pattern book. The interior furnishings like-wise follow fashions of the day. St. Mary’s and the Thomas White house (the last stop on the tour) are the only two buildings in the Barnesville area rendered in an academically identifiable style. Almost all others are variations on building types characteristic of the region. The original part of the house was built probably about 1835, when John Poole Sr. purchased the property from William S. Hays. John Hilton, father of the builder, purchased the property in 1847. When William Hilton returned to Barnesville after the Civil War to establish his woodworking mill, he and his family settled down at his father's place. In 1867 John Hilton deeded the property to his son, William T. Hilton, with a life tenancy agreement. The additional room that housed the post office was completed about 1900. It has been converted into dwelling space. Across the street from the Lawrence Hilton Price house is the Mary Morningstar House named for a former mayor of the town who was for 50 years a teacher in the county school system. The basic structure of the house is a log cabin which may have been built by Leonard Hays, Sr. who owned the lot by 1743. In the late 19th century William T. Hilton built an elaborate Victorian addition to the log cabin. A two-story porch stretches across the front of the older portion on the right. Ornate carved columns support the upper level which is enclosed with latticework. Considerable restoration work was done in 1997 by Barnesville Woodworking owned by David Johnson. The current owners purchased the place in 1999. A 1790 log cabin was relocated to the property and houses Morningstar Art Studio. Other notable houses in Barnesville dating back to the middle of the last century may be associated with Hilton, but lack documentation. Pre-eminent among these is the Dr. Joseph H. Stonestreet house, on the north side of the road just to the east of Miss Morningstar's home, constructed in 1861 for Richard Hays. The Hays family owned over a thousand acres in and around Barnesville, including the land for this house which they purchased in 1747. In 1850, Leonard Simmons Hays lived in this house and operated several town businesses including the post office and the general store across the road. Hays entertained graciously. His guests included Confederates J.E.B. Stuart, Col. Fletcher Webster, son of Daniel Webster and Col. W.H.F. Lee. The front section was rebuilt by William Hilton in 1890 and demonstrates Hilton's skill in blending styles and construction techniques. His addition sports a curved stairway and rail, heavy Victorian wood trim on doors and windows, plaster ceiling ornaments and marble mantels. The house remains in the Hays family and is occupied by Barnesville Mayor Emeritus Elizabeth Hays Tolbert and her son, Richard Leonard Tolbert, the fifth and sixth generation of Hays' descendants to inhabit this house. At the corner of Barnesville Road and 109 toward Beallsville is a large two-story frame house built by Hilton for Thomas O. White in 1903, five years before Hilton's death. 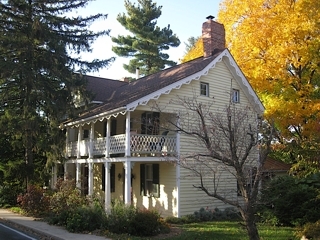 The modified Eastlake styling of the house shows an attempt to follow currently fashionable building styles, and is far different from the spare, simple style with which Hilton worked in the mid-1860s. In addition to the architectural interest of the over-all plan and styling, notable features include the Federal-style garlands below the cornice of the projecting bay and a Georgian-style window over the entrance door. Later renovations have kept the White house as a comfortable and attractive residence. The interior is more elaborately finished than in the structures Hilton built in the immediate post-Civil War period. Archways connecting rooms are supported by Doric columns fashioned of chestnut. Chestnut is also used for the wainscoting. Currently the Sugarloaf Network Systems is operated from the historic house. To see the old hand drawn Trail Guide site maps for Barnesville Town and Surround (now out of date), please go here.